This evening I decided to break in my new Lodge cast iron skillet to make Chicago Style Deep Dish Skillet Pizza. Believe it or not this was my first time cooking in cast iron AND my first time making deep dish pizza. I typically tend to prefer thin crust style pizza. The only time I really enjoyed deep dish pizza was years ago when I lived right beside Old Town Alexandria, Virginia. I used to enjoy eating at the Uno's Pizzeria there that served its legendary "Chicago Style Deep Dish Pizza". They had the BEST deep dish pizza. The only problem was you couldn't eat more than a slice or 2 because it was so thick. 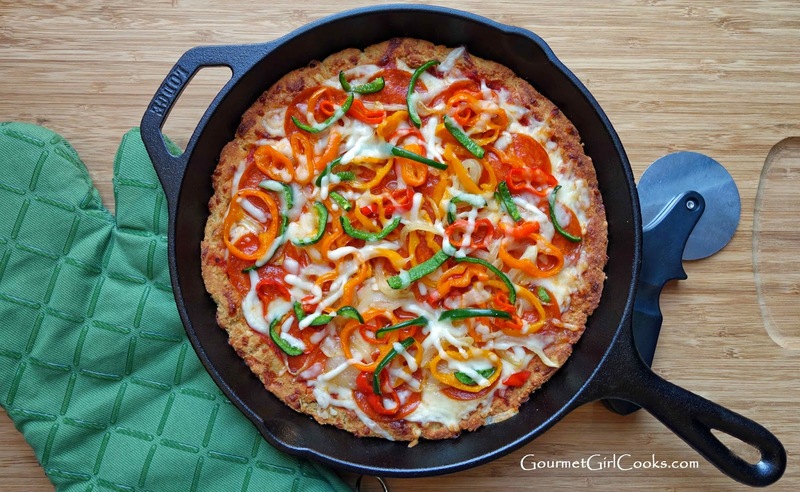 I wanted to use my cast iron skillet tonight so I decided to travel back down memory lane a bit and recreate a grain-free version of the Chicago style pizza I remembered. I needed to make more of a "bready" crust which meant I couldn't use my regular pizza crust recipe. I wanted it to be kinda-sorta like my Bagel Squagel, Bagel Sticks and Bagel Bread recipe...but not exactly. So, I came up with a nice dough that was easy to spread out in the skillet and it rose nicely and became fluffy, too. I was very pleased with how it turned out. I pre-baked the crust in my skillet until almost done and then added the toppings and baked it until done. I was a bit nervous trying this pizza out in a brand new cast iron skillet because from everything I've read, some foods (like breads) tend to stick more easily to a new skillet until it has been used repeatedly and become well seasoned. I just liberally greased the skillet with coconut oil (not enough to saturate the crust) to make sure it wouldn't stick. As my pizza baked, I kept my fingers crossed that I would be able to actually take a slice out of the pan. It worked amazingly!!! So, I did a double "happy dance"...both for my successful maiden voyage using cast iron and second for my first attempt ever at making a Chicago style deep dish pizza. 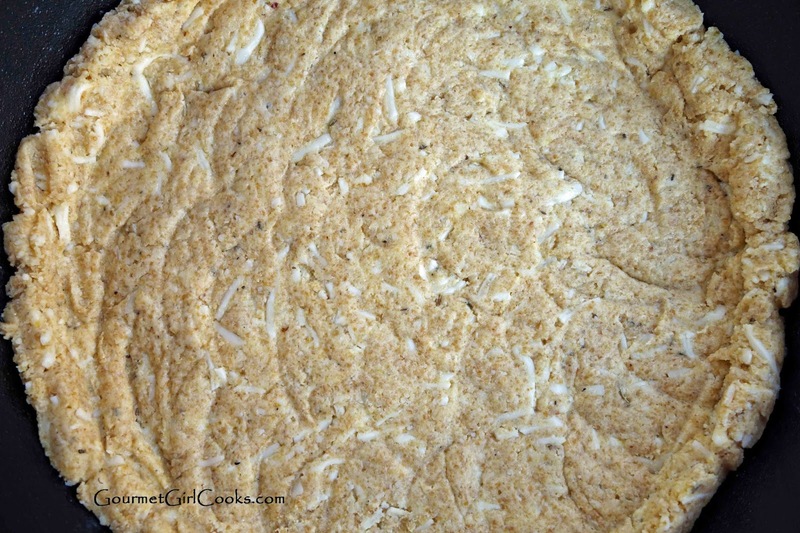 My deep dish pizza crust recipe makes enough dough for a 12-inch pizza. Since I only used a 10-1/2-inch skillet, I had about a tennis ball sized piece of dough left. I will use it for something else this weekend. 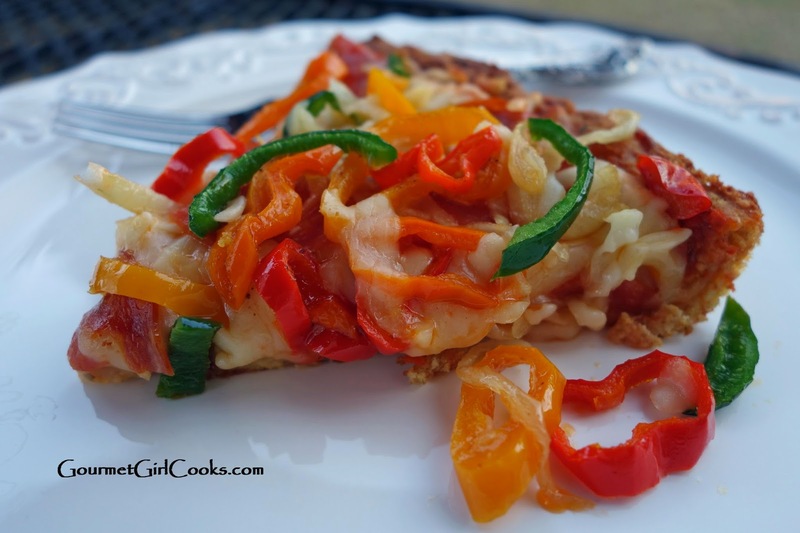 If you've missed enjoying deep dish pizza since going grain free...you will enjoy this pizza recipe. This isn't just "kind of like" deep dish pizza dough...it IS deep dish pizza dough. I put pepperoni, onion, red, yellow, orange and green peppers on mine. 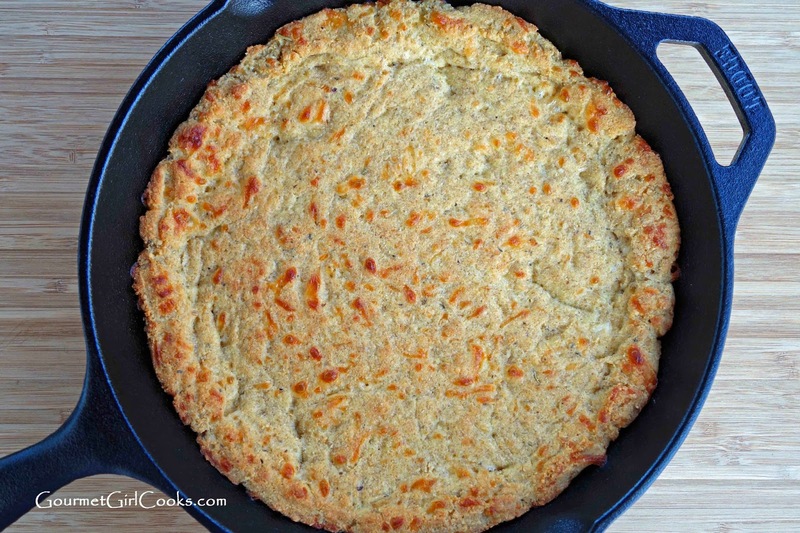 I snapped a few photos below as well as the recipe for my wheat, grain and gluten free Chicago Style Deep Dish Skillet Pizza. Enjoy! Preheat oven to 375 degrees F. In a medium sized bowl, mix first 9 ingredients together with a whisk to help break up any lumps; stir in 1 cup mozzarella cheese and Parmesan. Add eggs, buttermilk and olive oil; mix until combined and a dough is formed. Dough will be thick and slightly sticky. 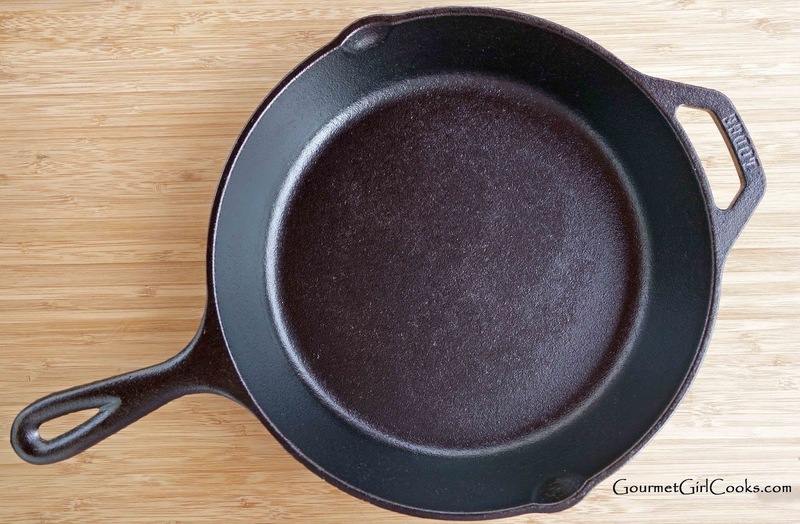 Generously grease a 10 to 12-inch cast iron skillet with olive oil or coconut oil (an ovenproof skillet can also be used). 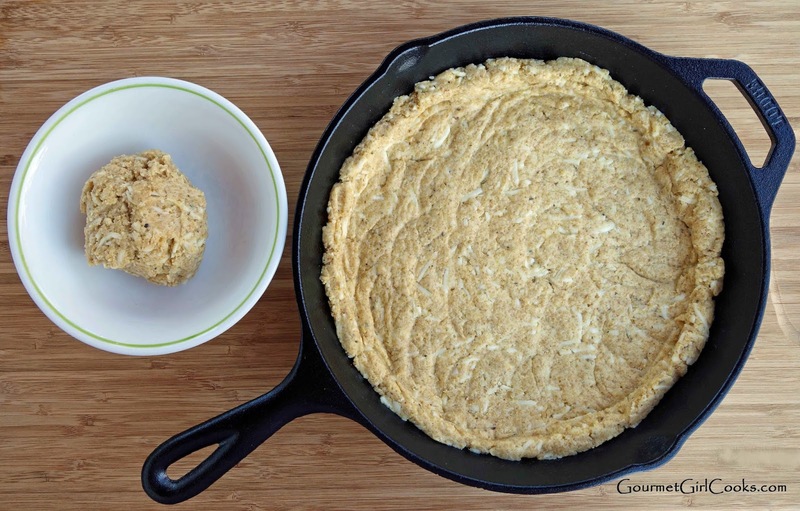 Using a rubber spatula sprayed lightly with oil, place the dough in the center of the baking pan and begin working your way pressing the dough out toward the edges, about 3/4 to 1-inch thick spreading the dough up the sides of the pan about 1-inch high. Bake for 20-25 minutes, or until light golden brown. Remove from oven and add sauce, mozzarella, and desired toppings. Bake an additional 8 to 10 minutes or until the cheese is melted. If additional browning is desired, run under broiler for a few minutes until bubbly and cheese is lightly browned. Carefully remove from oven and let sit about 5 to 10 minutes for cheese to set. Cut into wedges and serve. 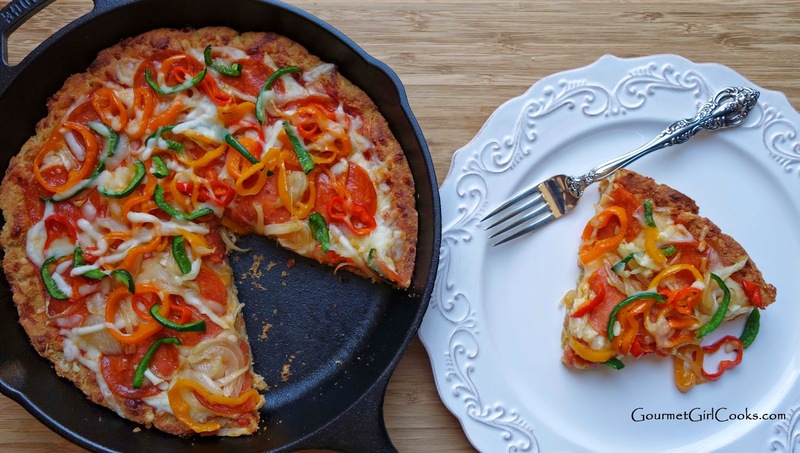 If using a nonstick ovenproof skillet, adjust baking time as necessary (it will heat more quickly than cast iron), then slide finished pizza onto a cutting board before slicing so you don't damage your pan. *Note: Pre-cooking vegetables containing lots of moisture like mushrooms, spinach, etc. will help prevent the pizza from becoming soggy. This looks SO GOOD! Have to try it really soon! I was just about to comment when we got a *furious* thunderstorm and I had to shut everything down! 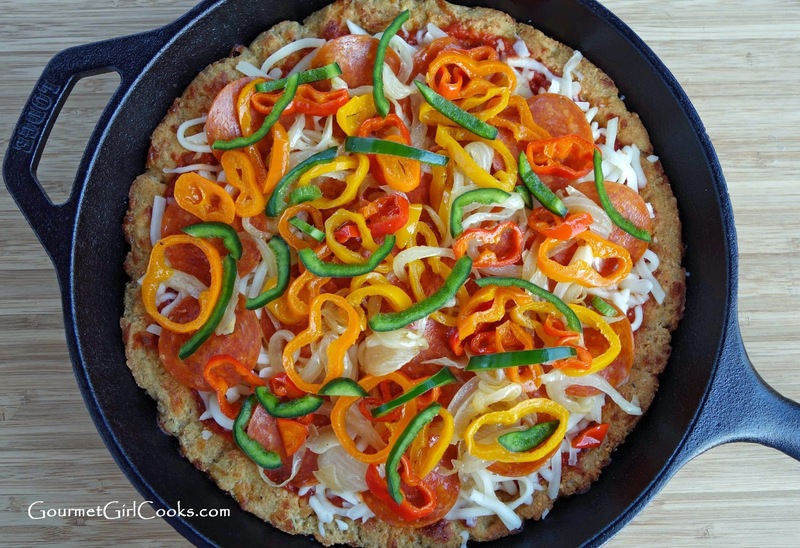 This pizza looks amazing and it will give me another reason to use my 10" iron skillet. I use my 8" all the time! I have a 12" which I haven't used yet ... it's so *heavy*! But Kroger had such a great sale on Lodge a while ago that I couldn't resist so I ended up with all three. Great idea using the extra dough for bread sticks. I use your "regular" pizza dough for crackers. Yum! Wow...a thunderstorm is what you think about when the weather is warm. At least you didn't have thunder snow! When I got this 10" skillet, I almost got the 8-inch too but decided to wait and test this one first. Not sure what I will make in it next! What is your favorite thing to make in your cast iron -- the usual stuff or have you tried baking with it, etc.? The surface of my pans is a little grainy. It doesn't seem to cause the food to stick, though. I read somewhere that the older Lodge cookware is very smooth and the more recently produced cookware is somewhat rough. I don't remember the time-frames that were given, but if you have some that was passed down from your grandmother, it's likely smooth, whereas what you buy now-a-days will have a rough surface. I haven't had mine long enough to see if it gets smoother with use. It's supposed to build up a layer of "seasoning" so you'd think that it would eventually get smoother. I read someone's comment "somewhere" that she uses a thin layer of melted Crisco before putting the pan away. That's the ONLY thing she uses Crisco for, BTW. She said it makes for a really nice cooking surface. Hmm ... sounds like it might be a good idea but somehow I haven't been able to talk myself into actually buying a can of Crisco! I have a small jar of LouAna that I use for the skillet, not the more expensive virgin coconut oil. The info on the LouAna website doesn't disclose how they process it so I haven't been eating it or cooking with it; I've only been using it for seasoning the skillet. The Lodge web site has some pretty interesting info and helpful hints. http://www.lodgemfg.com/ And there are cast iron blogs galore! Yes, no thunder-snow this time! It was a *very* intense storm cell, though. It sounded like hail against the windows, but it was just rain, thank goodness! They had two *inches* of hail not far from here. Trees uprooted, too, and power outages. So glad that stuff stayed to the north of us ... whew! Yes, it's crazy to have that type of storm while the temps are still so cool. I guess we'll just have to expect the unexpected these days! I read somewhere that since Lodge cookware is already "pre-seasoned" you need to oil only the interior after each use. I'm thinking also that you might end up with a greasy mess on your stove or oven if you greased up the exterior surfaces. The fire aspect you mentioned is something to consider, too. The Lodge web site says not to fill the pan more than 1/3 full of grease when deep-fat frying ... I'm thinking that's to keep the sizzling grease well away from the hot stove. So maybe we wouldn't want a greasy surface touching the burner, either. This looks amazing! So does it absolutely have to be made in a cast iron pan? If so, I'll have to get one! We tried this last night, it was fantastic! Thanks so much for the recipe! My 12-inch Lodge cast iron skillet is the most-used pan in my kitchen! I use Mark Bittman's method to make the easiest and best roast chicken. Preheat the oven to 400 with the rack in the lower third. When it's hot, put your skillet in the oven to heat for 10-15 minutes. Pat a 3 - 4 pound chicken dry with paper towels. Sprinkle generously with salt and pepper. When the skillet is hot, put the chicken in breast-side up. Roast for 45 - 60 minutes. (Time depends on the size of your chicken.) The hot skillet helps the dark meat get done faster so you don't have over-cooked breast meat waiting for the thighs to be done. It's genius! This recipe does look good. I'm going to try it. Black cast iron cookware is seasoned, so don't worry about the surface being nonstick for cooking. If it was not seasoned, it would be a gun metal gray color with a rough surface - I've had one of those. I had to season it myself by greasing it inside & out and heating for a long time in a very hot oven. It's black now, and becoming a better surface with each use. Just don't clean your pans with soap, soak them, or clean in a dishwasher. Just wipe them out with a wet cloth under running water, then place on a hot stove top burner for a bit to dry them out. Just a minute on medium heat will do -- then let them sit and cool off before storing. That's what my Mamma always did with her Mamma's pans that she inherited. I'll do the same when they're mine. Hi there. I'm a new subscriber and just wanted to "weigh-in" though a little late. on the cast iron skillets. I think that you'll be glad that you found them. I now have skillets used by my mother, my grandmother and great grandmother. I have used them daily since I started cooking many years ago and there are many recipes that I just wouldn't attempt without them. The crust on the cornbread I used to make BD (before dieting) had a crust that would be hard to duplicate I believe, and the large 12 inch (- though heavy-) cooks like a griddle, but better I think, for meats like fajita or chicken breasts. Just be careful and put everything in there DRY because it will definitely sizzle otherwise. I put in the meat and pile it with onions, peppers, mushrooms and whatever applies and cover it will a lid till the pan juices form. The trick with cooking anything on cast iron, in my opinion. is to use just enough oil to coat the pan, in most cases, and get the surface hot enough that a drop of water will sizzle on it. At that point I have really never had anything stick on it - not even scrambled eggs. Of course mine are well seasoned and if you coat it with oil before putting it away, just use wesson oil or something and wipe it down with the oil ...otherwise you could get a gooey crust in it if you store it too oily. Basically, by putting the light coating of oil on the pan and heating it well before cooking you are seasoning it every time you use it. Of course, I am speaking of the older kind and have no experience at all with the newer ones so I hope some of this applies. Thank you so much for sharing your recipes, I am enjoying them immensely and sharing them often. This was a very good dish! I have been following you a little over 4 or 5 months now! Thanks for creating this blog! Do u know the net carbs or protein for this? I have everything but the buttermilk:/ I have coconut milk and I have half and half. Is it ok to use one of those instead of buttermilk? Can you just cook it in the oven? I don't have a cast-iron pan can use the pizza pan? Do you have a nutrition breakdown for the pizza crust recipe? If you're going to give a shout out to Uno's which is good, but a global chain you need to give props to the DC chain with better pizza Armand's... as a kid we used to park our boats in old town (sailing camp) just to get the pizza. They had locations in DC/Montgomery county too (our summer camps would do pizza day there)... Sadly most are closed at the moment. Can you substitute anything in place of the flax?